HanStone™ is an innovative new product that combines natural quartz with high quality polymer resin and pigment to produce a durable yet luxurious stone surface. There are many styles to choose from with various types, sizes and colors of quartz crystals from around the world that create the perfect look for your kitchen, laundry or bath. 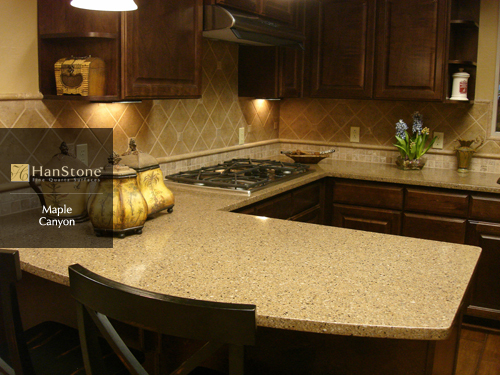 Hanstone is made of primarily natural quartz which is rates a 7 out of 10 on Mohs Scale of Hardness. In english, that means its strong! Simply clean up any spills with soap and water. For routine cleaning, use a small amount of cleaner that is non-bleach and nonabrasive along with warm water and a damp cloth. Repeat as needed to keep the lustrous gloss and radiant sheen. Although HanStone™ is resistant to stains, any type of spill should be cleaned as soon as possible. Any liquid spills, fruits, vegetables, or other foods should be wiped up and cleaned with soap and water. Please refer to the HanStone™ Care & Maintenance Guide. HanStone can be used for kitchen countertops, islands, peninsulas; bath vanity top, shower stalls and shower surrounds; table tops, fireplace surrounds, window sills, wainscoting, wall covering and threshold. 2012 Granite by Steve Moon All Rights Reserved.